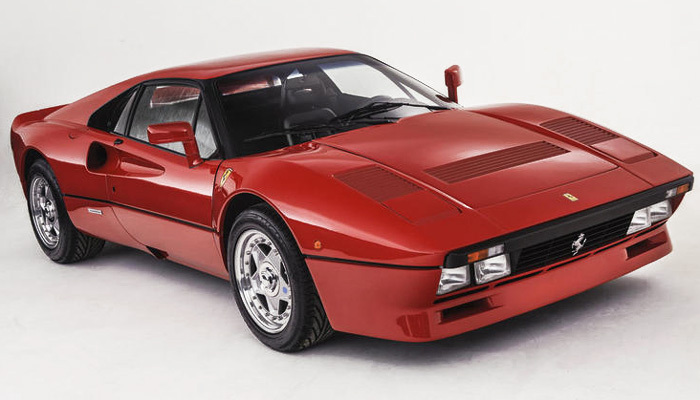 Although superficially similar to the contemporary 308GTB Quattrovalvole, the 288GTO was radically different beneath the skin, mounting its V8 engine longitudinally rather than transversely, a change that necessitated a new chassis with a wheelbase extended from 234cm to 245.1cm. This new frame was constructed of steel tubes in the traditional manner while incorporating the latest in Formula 1-derived composite technology in the form of a Kevlar and Nomex bulkhead between the driver and engine. The alteration in engine layout had been made to accommodate twin IHI turbo-chargers and their associated Behr inter-coolers and plumbing; the adoption of forced induction requiring that the quad-cam, 32-valve V8 be downsized from 2,927cc to 2,855cc to comply with the regulations. Ferrari's considerable experience gained from turbo-charging its Formula 1 engines was deployed in adapting the 308 unit, the latter in highly modified 288GTO form producing 400bhp at 7,000 rpm and a mighty 366lb/ft of torque at just 3,800 revs. Top speed was a staggering 189mph.